The Lofts. This building is located at the top of Cosy Beach Pratumnak Hill, convenient for access to Pattaya & Jomtien. Also walking distance for the amenities that Pratumnak has to offer. 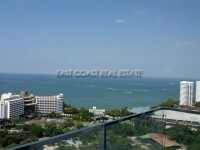 This 80 sqm, pool view, one bedroom unit is very well decorated and furnished. It has European kitchen with plenty of room for a dining table, spacious living area with the relaxing sofa in front of the LED TV. The balcony looks out over to the pool. Pratumnak Hill is one of the best locations in the area. It’s peaceful and close to everything. The beach is secluded and there is a large choice of restaurants, shops and bars. There are a swimming pool and security. Rental is on a minimum 12 month contract at 18,000 Baht per month. Also available for sale in Foreign Name ownership with 50/50 split for tax and transfer fee. Living area : 80 sqm.